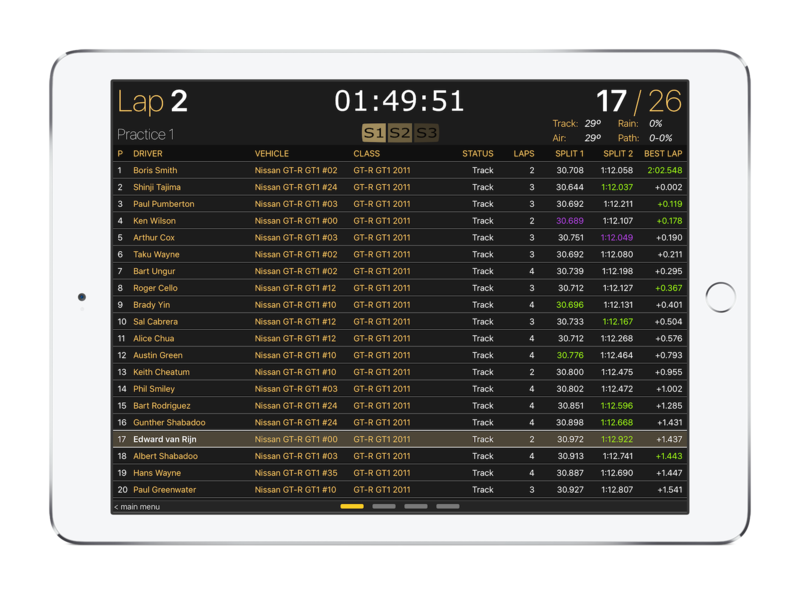 RacePad is the ideal iPad and iPhone companion app for rFactor and rFactor 2. 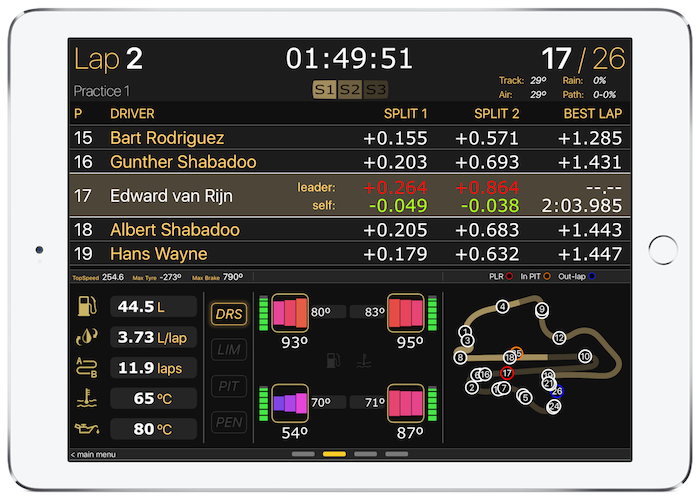 All the vital racing information you need is displayed on the device, freeing your monitor from any clutter. And the best part: RacePad is absolutely free! No ads, no in-app purchases. 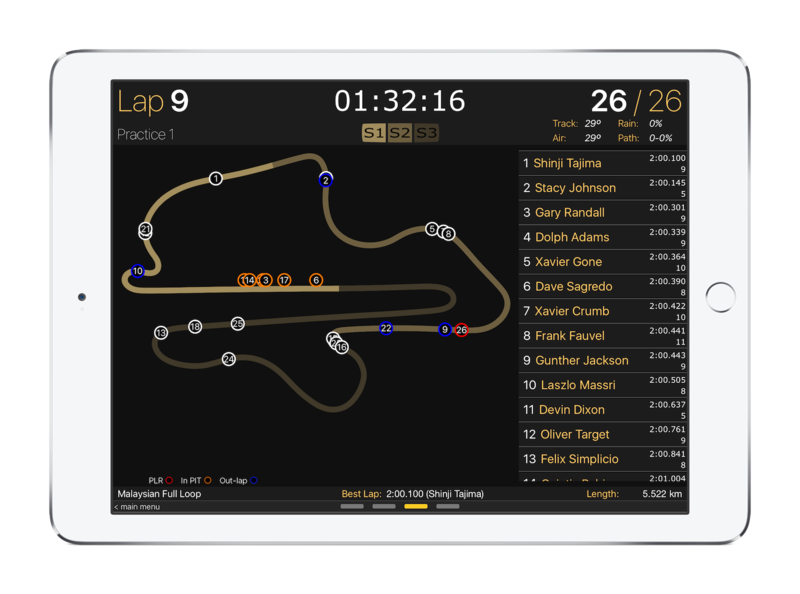 RacePad can be downloaded from the App Store for free and is supported on any device running iOS 9 or later. RacePad requires a plugin to connect to the games and can be found on the download page. The timing view provides real-time updates on the drivers lap times. In practice sessions it indicates when a driver is in the pits, when they improve their sector or laptime, what the difference is compared to the leader, and how many laps they have done. During the race it displays the best laps, the number of pitstops and the gaps between the drivers. The dashboard combines multiple elements into one view, providing many essential details while on-track. 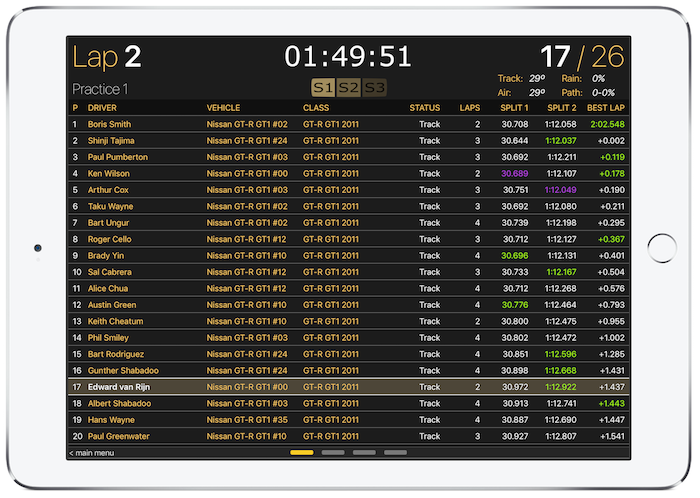 On top, the dashboard displays player-centric timing, indicating how each sector and laptime compares to the driver's own and the direct opponents' times. 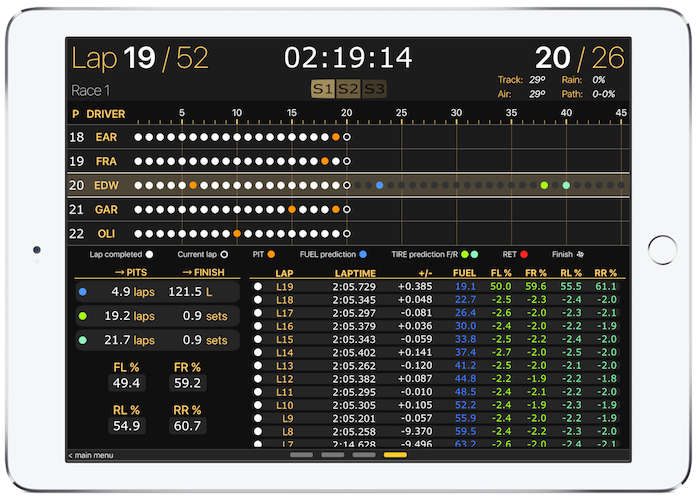 Below, the dashboard shows strategic data, a car status complete with visual tyre temperatures and wear, and an interactive track map. 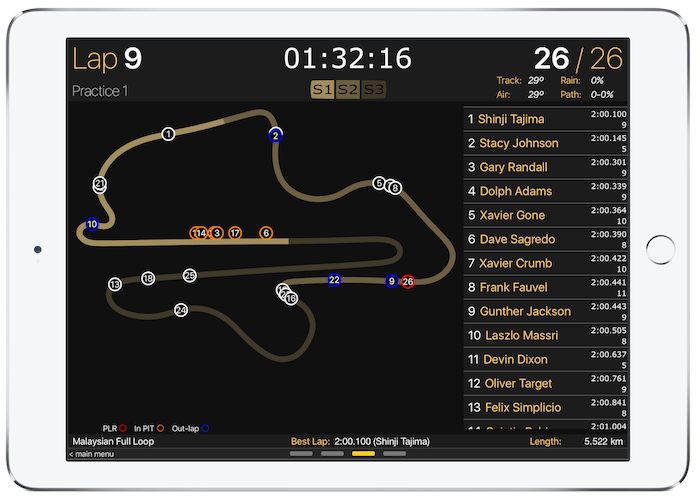 The map view displays a large version of the track map with all drivers updated in real-time. Different colours are used to indicate whether a driver is on an out-lap, in the pits or previously lapped. The map is generated automatically for any track. The strategy view is essential in preparing the best race strategy or adjusting it on the fly during the race. 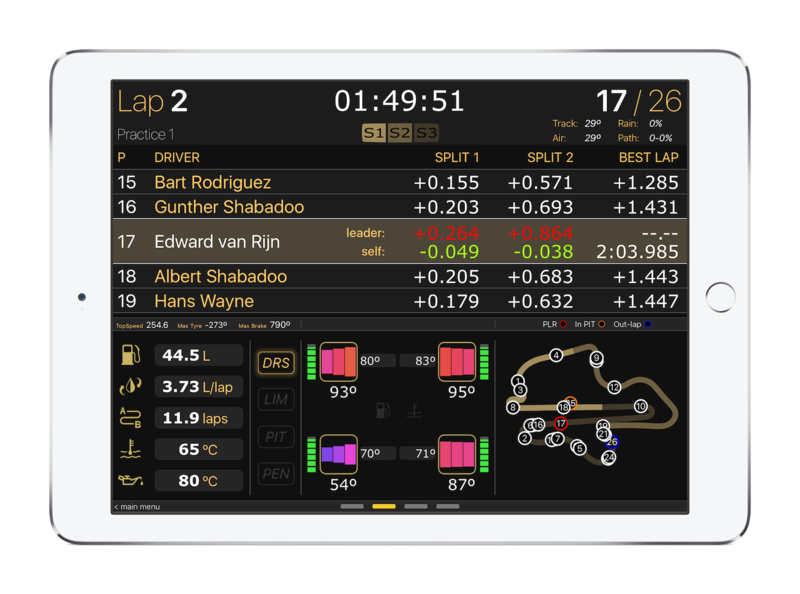 RacePad keeps track of your fuel and tyre usage, allowing it to pinpoint exactly when your next pitstop is required. 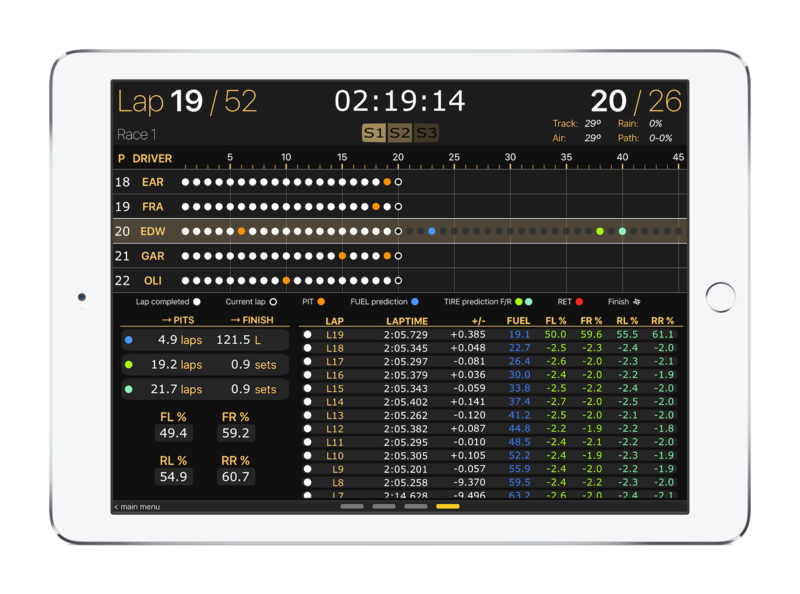 As RacePad keeps track of every single lap you have done, you can review the details on a lap by lap basis and see how they have affected your laptimes. Learn more about all the different features in the tutorial.